Diary of an Incompetent Soprano: Amendment to Diary Entry 2: Opera was my first love but Zumba will be my last. Amendment to Diary Entry 2: Opera was my first love but Zumba will be my last. So, a couple of weeks ago I did my best audition ever. I was SO happy with it I can not tell you. I sang like a dream, nailed the script work, the resident director seemed excited by what I had done, the MD thought my voice a bit too operatic (but we will skirt over that) but I showed him I can sing with less vibrato in some scales and even the movement call was not a total disaster. Or so I thought. Those who know me will attest that I rarely think anything has gone really well so after an extremely fallow period, audition wise, I was thrilled that an audition had gone so well AND that it was for something I really wanted to do (and thought I could do). Honestly, I could not have done any better under the circumstances. So imagine my disappointment when I was told they weren't recalling me as my dancing was not as good as some of the others. I was flummoxed. For one, it was not dancing it was movement and for two, I did think I had showed that I could do what they wanted. (By the way this is not a post wallowing in self pity. I am coming to the point.) The moment I heard I was not being recalled I decided that was it. No more auditions, it is time to move on. I am not giving any more of my life to this ridiculous profession. Then I thought about it properly. I am a mover not a dancer. Had I done more dancing as a child perhaps I would be a better mover now but I didn't so there is no point dwelling on this. Yes, there were better dancers at the audition so they weren't lying or being intentionally horrible to me when they informed my agent this was the reason I had not been recalled. The other factor I had to consider is that I am incredibly unfit at the moment. I joined a gym about 6 weeks ago and, yes, I am more fit now than I was 6 weeks ago but not fit enough to stop me sweating uncontrollably the minute someone asks me to do a box step (actually there were no box steps in the audition). Had I got my act together 5 months ago and joined the gym upon my return from the Phantom of the Opera tour things could have been different, maybe not. Again, no point dwelling on that fact. This is not the first time I have ever been a member of a gym but this is the first time that I have wanted to go. It may be because I have a lot of free time on my hands and no money (so I can't go shopping at will) but my gym membership is £30 a month and I don't have to part with any dosh when I go there so I am getting out of the house and doing something for, what feels like, free. I am obsessed with going at the moment. I have been the past 5 days in a row and I am contemplating going twice today. Once to use the gym and pool and again, this evening, to do Zumba. That is how addicted I am right now. The main cause for this addiction was my introduction to Zumba. O. M. G.! Zumba is infectious. I have a friend who loves Zumba and I never understood it. How can anyone be that obsessed with an exercise class? Well, now I know. Zumba is not just an exercise class. It is so much more. Well it is when you have a good teacher. I am in no way an expert but the very first class I went to was run by a perfectly nice lady. She knew her stuff, she was able to teach the steps, she had a constant smile on her face and would now and then shout out words of encouragement. I came away feeling like I had had a good workout but that was it. I could not understand how Zumba had become the craze it had from what I had just been a part of. I decided to give it another go. There was another class on Thursday so I would see if I had missed something. Oh my hat had I missed something. I was standing in the studio on Thursday surrounded by a different set of people and there was a definite buzz of excitement and anticipation in the air (this had certainly been lacking on Monday). Moments later a red headed woman came bounding into the room, went to the stereo and cranked up the music. It was SO loud. She went to the front and so began the greatest class of my life. Her enthusiasm and passion was addictive. She gyrated, grinded and pulled some fantastic faces. She got totally lost in the music and what she was doing and all we had to do was copy and hope that we looked a fraction as good as her. We didn't but we didn't care and that was the thing I liked about it. Nobody cares what you look like doing Zumba as long as you commit to it. It may also be that being almost 40 I really don't care what I look like anymore (the pic below proves this I think!). So the point of this massive advert for Zumba is what? Well, I hope that this new found enthusiasm for exercising means that, given a little more time, I will not be a sweaty mess at the back of any future movement audition and will be able to keep up. Or, at the very least, I will not care what I look like, gyrating and grinding away, ever again. 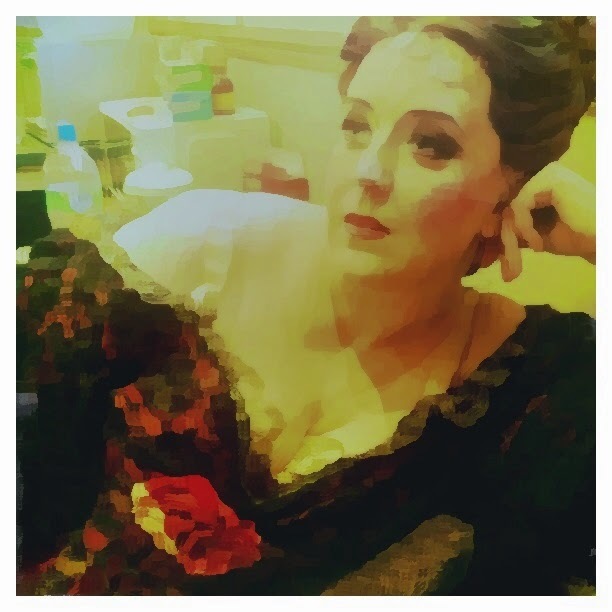 Noreen (Wardrobe Mistress in the Phantom of the Opera) doesn't care! Recreating the iconic Flashdance shower moment.